It was always going to be extremely difficult against the reigning champion Mark Selby. 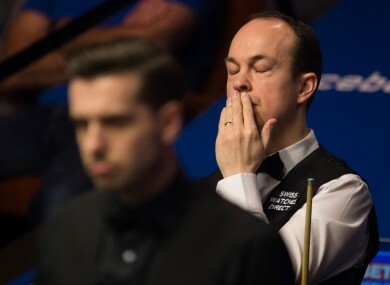 HE NEEDED TO win the longest frame of snooker ever played to qualify for the World Championship but Fergal O’Brien’s time at the tournament hasn’t lasted very long. The Dubliner was comprehensively beaten 10-2 by reigning champion Mark Selby in his first-round match at The Crucible on Saturday. It was the toughest draw imaginable for O’Brien and he was outplayed from the very start as Selby raced into an 8-0 lead in the best-of-19 decider. But the 45-year-old ended the first session with a flourish and afforded himself a smile as the crowd broke into rapturous applause following a terrific long-range pot that gave him control of a frame he subsequently claimed. However, Selby was never likely to give up such a commanding lead and began the evening session with a 92 break to make it 9-1. O’Brien did get another back but Selby completed the job shortly after to book his place in the last 16 where he’ll face either Ryan Day or Xiao Guodong. Email “He dug deep to qualify but Fergal O'Brien didn't last long at the World Snooker Championship”. Feedback on “He dug deep to qualify but Fergal O'Brien didn't last long at the World Snooker Championship”.